NOTE: Microchip updates its tools regularly. This page is an older version that we have preserved for the convenience of those who are supporting existing designs based upon older versions of our tools. Please check https://microchip-dev.wikidot.com/tls0101:config-bits-lab for the updated version of this page. Close any open projects in MPLAB® X IDE by right clicking on the project name and selecting Close or by going to File and choosing Close All Projects. Double click on ConfigBits.c under Source Files folder to open the C file in the editor window. The content of ConfigBitsLab.c (the main source file for this project) is not considered in this lab; instead we will concentrate on ConfigBits.c. This file contains the compiler directives to set the PIC configuration bits for this project. Based on the contents of these directives, the compiler will append the appropriate words to the build image before the image is programmed into the PIC. Best practices call for the programmer to code the desired configuration bit settings somewhere in the project. If the configuration settings are not coded the compiler will generate the default configuration bit settings. 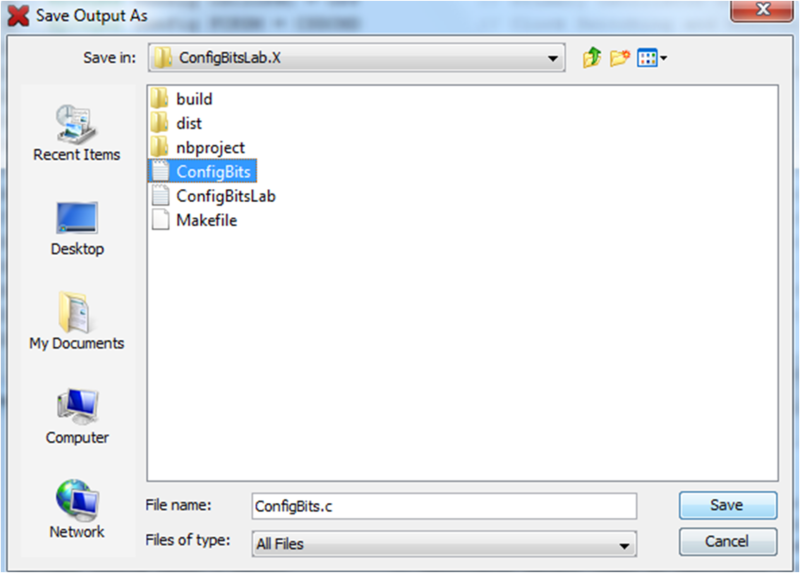 Configuration bits can be set in any source file within the project. Quite often configuration bits are set within the main.c file. They can also be defined in an included header (.h) file. This lab uses a separate file called ConfigBits.c to program the configuration bits which makes it easier to manage them as we will see in the following steps. Click on the icon. This will clean and build the project. The Configuration Bits window informs us the Watchdog Timer is currently disabled. 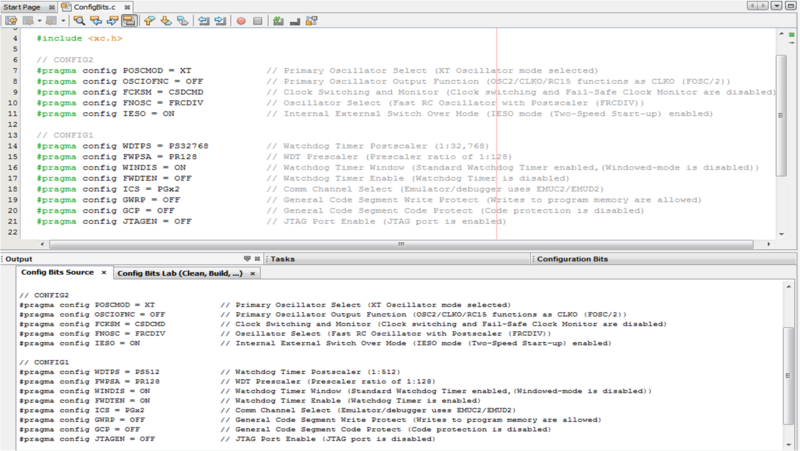 For this example we have decided to enable the WDT with the prescaler set to 128 and the postscaler set to 512. Repeat step 5 so that the WDT Prescaler is set to 128 and the Watchdog Timer Postscaler is set to 512. 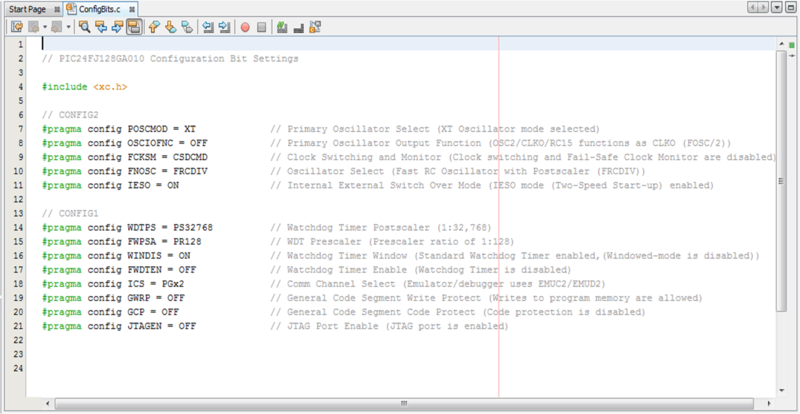 A tab in the Output window will open and display the code needed to generate the configuration bit settings. Compare the code in the Output Window to the code currently in ConfigBits.c to ensure the changes you want have been coded. Overwrite the existing file when asked. The text may be saved as a header file (.h) instead of a C file. You may also simply “cut and paste” the content of this window to a file of your choosing. 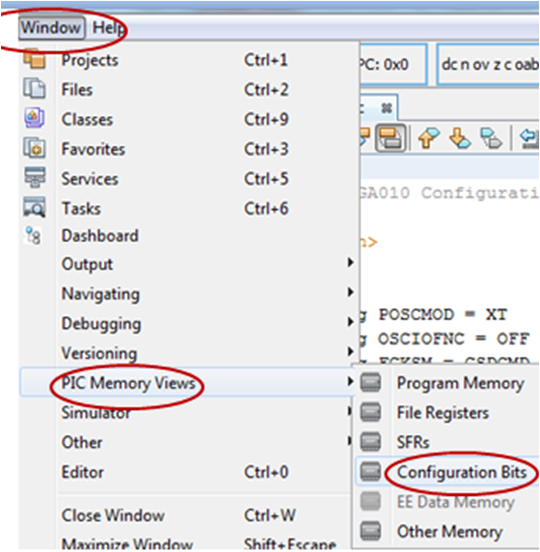 Verify the configuration bits for the project have been modified by opening the Configuration Bits PIC Memory View window.